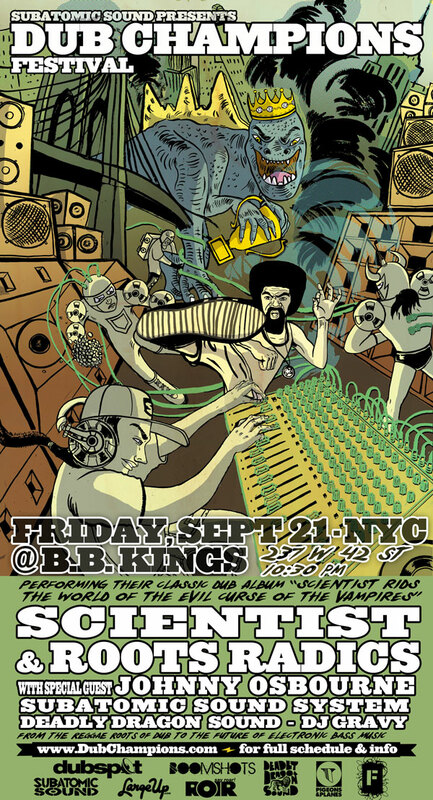 Friday 9/21 — Scientist & Roots Radics rid NY of the Evil Curse of the Vampires! w/special guest Johnny Osbourne, the first time these three join forces to perform their classic dub album “Scientist Rids the World of the Evil Curse of the Vampires”. You can’t get any better than one of Jamaica’s pioneering dub innovators, Jamaica’s #1 band, and one of Jamaica’s best vocalists together on one stage. Lookout for more special guests like Screechy Dan touching the mic, percussion legend Larry McDonald, and more! Sign up at www.DubChampions.com for ticket discounts. Get more details, dialogue, & RSVP for the event on Facebook. 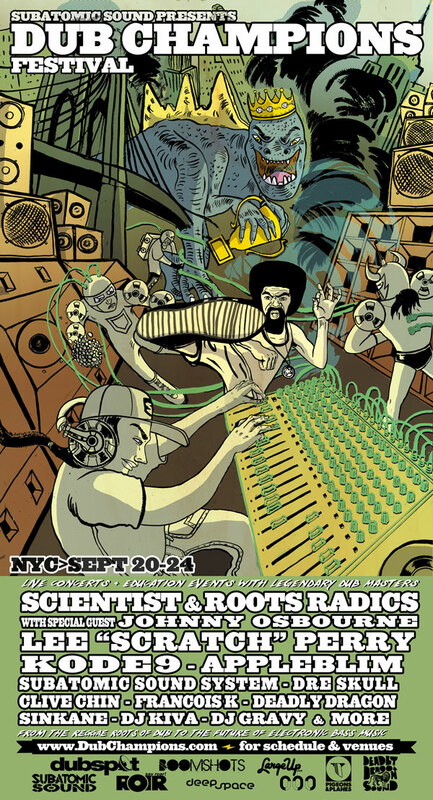 Dub Champions festival runs from September 20-24 in NYC! Check the full lineup including Lee Scratch Perry, Clive Chin’s Augustus Pablo tribute, Kode9, Appleblim, Dre Skull, and more. Roots Radics’ version of Cus Cus, one of the baddest reggae recordings of all time. Dubbed by Scientist’s mentor, King Tubby. Thur 9/20 – Dub Champions Festival warm up! Deadly Dragon’s Downtown Top Ranking, Dubwise! The Dub Champions festival warms up on the first night with a NYC institution: Deadly Dragon Sound‘s weekly rub-a-dub party, right around the corner from the Deadly Dragon record shop: all vinyl selectors (aka DJs) with DJs (aka MCs) rocking the mic, preserving the Jamaican sound system culture from which dub originally evolved. Always expect surprise guests. Vibes come correct. ADMISSION IS FREE! Selector JD and Mr. K.
JD Ranking & special guests pon di mic! Get yourself in a dubwise state of mind for the rest of the festival events. RSVP on Facebook. Super DISCOUNT admission when you RSVP here! 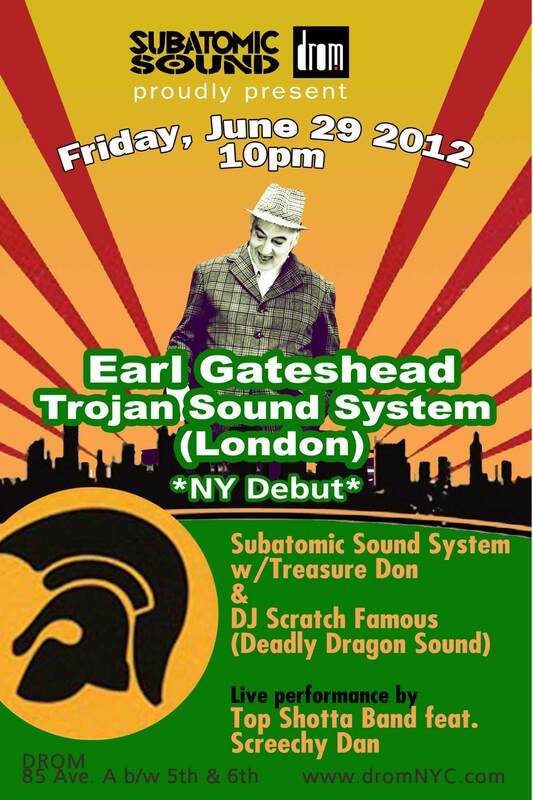 NYC debut of London’s Trojan Sound System! Check this exclusive mix and interview at Time Out New York to promote the debut of Trojan Sound System lead selector Earl Gateshead, this Friday in New York City at Drom.